Habit: Sprawling to twining, 18--60 dm; herbage puberulent. Leaf: 4--8 cm; blade oblong to ovate, base truncate or subcordate, tip generally obtuse; upper pairs fused around stem, others generally with green or +- scale-like stipules. Inflorescence: spike, long, interrupted, densely glandular, especially in fruit. Flower: corolla 12--16 mm, strongly 2-lipped, generally pink, glandular-hairy or hairy, upper lip shallowly 4-lobed; stamens, stigma exserted. Fruit: +- 8 mm, red. 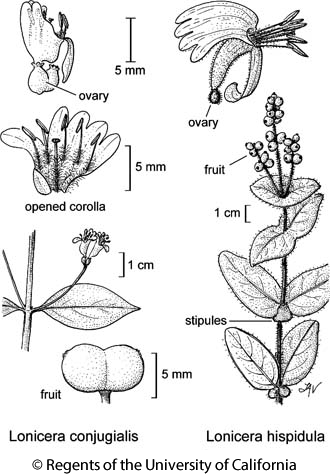 Citation for this treatment: Charles D. Bell & Lauramay T. Dempster 2012, Lonicera hispidula, in Jepson Flora Project (eds.) Jepson eFlora, http://ucjeps.berkeley.edu/eflora/eflora_display.php?tid=31505, accessed on April 25, 2019.